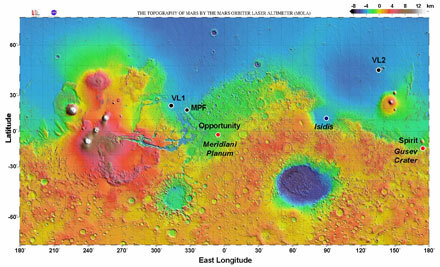 Locations of landers and rovers on Mars. VL1 is Viking Lander 1, a stationary robot from 1976. MPF is Mars Pathfinder, a roving vehicle from 1997. 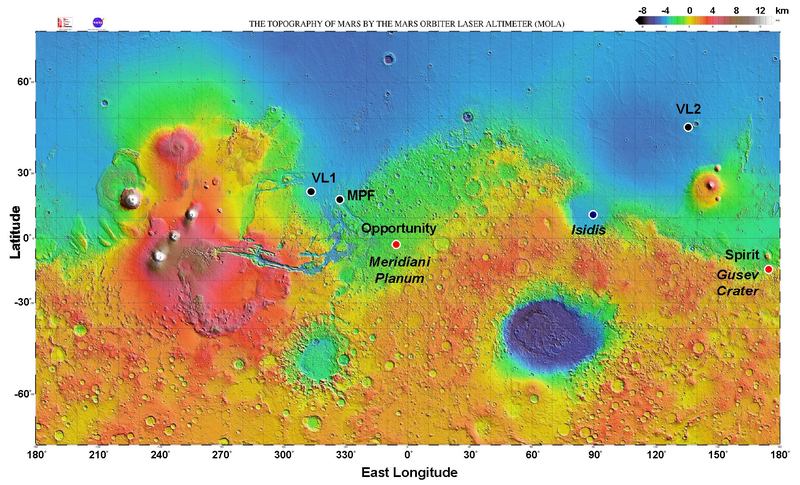 Opportunity/Meridiani Planum is the second of the Mars Exploration Rovers that landed and drove in 2004. Isidis was the projected landing site for the European Space Agency's Beagle 2 stationary lander that was lost on arrival at Mars in 2003. VL2 is Viking Lander 2 that landed in 1976. Spirit/Gusev Crater is where Spirit landed and drove in 2004.